Home Biafra Featured Nigeria Opinions SNEAKY GENOCIDE COMMITTED BY PETER OBI AND REASONS FOR US TO REJECT HIM. SNEAKY GENOCIDE COMMITTED BY PETER OBI AND REASONS FOR US TO REJECT HIM. 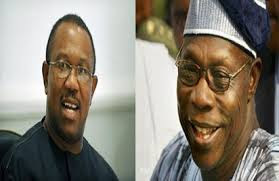 The sneakiest Genocide committed was under the guise of stopping the agitators for Biafra Independence during the tenure of Peter Obi the then Governor of Anambra State, Achike Udenwa Governor of Imo State and Olusegun Obasanjo as the then President of Nigeria. During these periods that spanned till 2009, Nigerian soldiers were on rampage at Onitsha, Nnewi, Oba, Ihiala and environs shooting, killing, and maiming anything that has a suspicion of being a Biafra agitator. As the shootings were going on, real Biafra agitators escaped into various dens while stranded travellers, unsuspecting trader and residents were branded Biafra agitators and shot. By the time the exercise was over, estimated 5000 people were killed and the affected families took the remains of their relatives and buried quietly to avoid being killed too by the rampaging soldiers. All these wickedness was at the behest of Peter Obi claiming to be a follower of ex Biafran leader Odumegwu Ojukwu. IPOB is here again today reminding you that the same people who ordered the massacre of thousands of Igbos under the guise of anti-Biafra stance have now come again seeking for your vote in order to continue their genocide. As Biafrans negotiate their way out of the Biafra quagmire in the Nigerian context, we must remind ourselves that the greatest enemies of Biafrans common good is not Yoruba or Hausa Fulani it is Igbo politicians who corner the lot of their people for personal aggrandizement, it is the Igbo politicians who invited Federal Troops to kill unarmed civilians without exhausting avenues of negotiations.